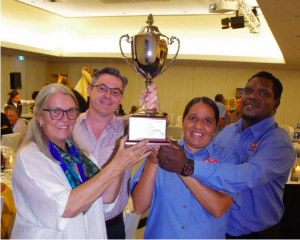 The Grand Ballroom of Darwin’s SkyCity casino shone from the community pride Santa Teresa representatives displayed at the gala awards ceremony when they were named the Territory Tidy Town. After being highly commended and named winner in several categories at the recent Keep Australia Beautiful (NT) Tidy Towns awards, our remote Aboriginal community of Santa Teresa was named the 2018 Territory Tidy Town. “Santa Teresa has won Tidy Town awards in different categories over theyears – so it was great that it is now named the Territory Tidy Town”, said MacDonnell Regional Council President, Roxanne Kenny. The good people of Santa Teresa embraced the responsibility to keep their community clean. Strong community support comes from their own Atyenhenge Atherre Aboriginal Corporation (AAACorp) and the Ltyentye Apurte Catholic Education Centre and Church. MacDonnell Regional Council’s Civil Works team provides the backbone for getting things done, but they are well supported by the efforts of residents and stakeholders. At this year’s awards ceremony Santa Teresa featured among other MacDonnell Regional Council communities when we once again emerged as the major winners of the evening. Having won Best Medium Community Santa Teresa then won the major Territory Tidy Town award qualifying it to represent the Northern Territory at the National Tidy Town awards in Smithton Tasmania in early April next year. Santa Teresa also won the Community Participation award while the Lytentye Apurte Catholic Education Centre won the Territory Tidy Town School award and its Deputy Principal Justin Colley was awarded the Territory Tidy Town Citizen award. Santa Teresa was also commended in the Litter Management and the Resource Recovery categories. The Finke community won the Resource Recovery award and the Waste Management award, and was commended in the Community Participation and the Culture and Heritage categories. Imanpa and Hermannsburg were both commended in the Litter Management and the Community Participation categories. Areyonga was commended in the Territory Tidy Town School category. Wallace Rockhole won the Best Small Community award and MacDonnell Regional Council won the Best Regional Council award for the fifth consecutive year. MacDonnell Regional Council has consistently won the Best egional Council award since it was introduced in 2014. This award reflects the high standards set in our remote communities and includes the top honour of consecutively being named a Territory Tidy Town winner: Finke in 2017, Areyonga in 2016, Mt Liebig in 2015, and Titjikala in 2014 and 2013. In accepting the Best Regional Council award, our CEO Jeff MacLeod was gracious and after thanking the attending politicians for their support and noting that it is through the various community and infrastructure grants the government administers that we are able to bring improvements to the lives of our residents. He then gave our secrets away to a room full of regional councils when he said “ it is important to commit to the process and involve everyone from those on the ground doing the hard work to the bosses in the offices and when you bring residents and stakeholders along with you it really makes it all worthwhile ”.